Tension in Gondar city, which began as a clash following a joint operation by the federal police and the anti-terrorism task force against the alleged outlawed local group, Wolqayt Committee, bubbled over in to wider protests, resulting in loss of life, property damage and looting, reports DAWIT ENDESHAW, FORTUNE STAFF WRITER. Now, as the dust slowly settles, local businesses are still very much feeling the pinch in the absence of insurance payouts and with a drastic reduction in customer numbers. Indeed, many believe that their business activities are no longer viable in the area. A total lack of communication between the anti-terrorism unit, and federal and local police, enhanced the impact of the initial action. 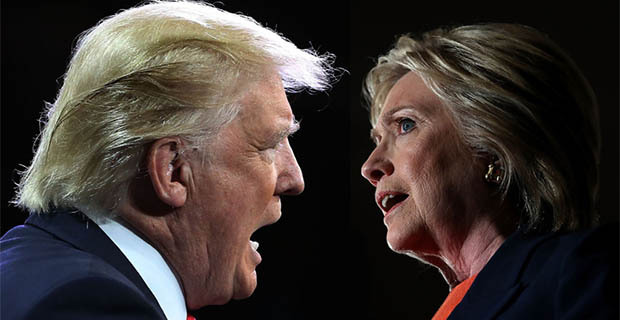 For now, though things remain calm on the surface, there is still ample tension, fear and concern bubbling below the surface. 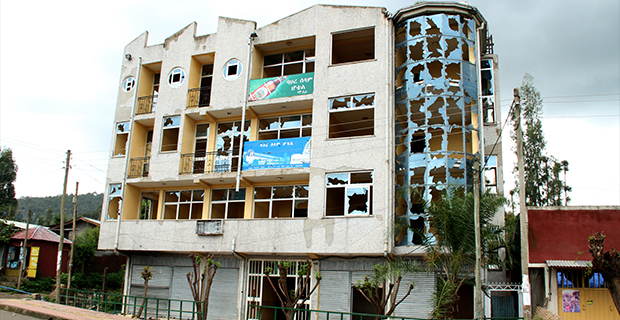 Bahre Selam Hotel, which is located in Kebele 18 locally called Maraki, was one of the victims of the unrest that occured in Gondar. A fully damaged selam bus around Piassa in city of Gonder, which was destroyed during the unrest. 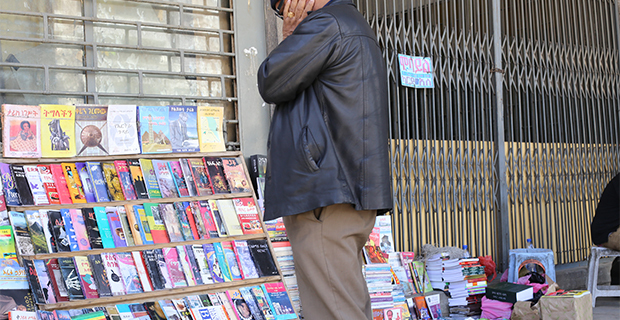 In North Gondar, 725km north of the capital, except the sight of burnt buildings, broken glasses here and there and the presence of a rather large number of uniformed police officers, the city’s day-to-day routine and movement of people continues as normal. There are those, however, who claim to have been affected to the point where they can longer provide a service to the public. Hotels, banks and other businesses continue to suffer from the scars of economic loss. Closer discussion with some residents signals that beyond this, the tension and fear still looms large. This all follows the unrest two weeks ago, when the city was hit by a sudden public protest that many did not see coming. “We had no prior knowledge of the operation assigned to the federal special force,” Mekonent Melkamu, deputy head of the North Gonder Zone Administration and the Security Affairs Department, told Fortune. After two weeks, the city police continue to assess the situation and have declined to estimate the cost of the damage. But the damage is felt by business owners and residents, who all have their own stories to tell – all with uncertainty. Hotels are the institutions that have been attacked the most, with a variety of different magnitudes. Banks, transport buses, drugs stores and boutiques have also taken their share, mainly suffering from looting. The Bahreselam, Hibret, Quara, Tana Aste Bakafa, Hohema and Central hotels were all victims of the looting and destruction under the guise of public unrest, which came after a shootout, killings and multiple arrests of members of a group that calls itself the “Welqayt Committee”. “The damage continues in the form of declining business, since the number of both local and international tourists has decreased,” said a shift manager at one of the attacked hotels. Atse Bakafa, located at the heart of the city in Piassa has to spent close to 40,000Br to repair the broken glass and recommence operations. He estimated the decline to represent close to an 80pc reduction in business. The hotel is now considering halting its business and instead to renting the building out to other business entities. Established eight years ago, the hotel has close to 115 employees. Bahrselam is the hotel that has suffered the most damage, and sees no chance of making a recovery until insurance monies are paid. It was back in 2010 that the hotel kicked off its service, with 30 rooms and 20 employees. Now, owners claim that the total damage of their hotel and residence, sits at close to 10 million Br. As went to see the hotel on the afternoon of July 26, the hotel was empty. The main gates of the hotel were broken and exposed. Some of vandalised property, such as refrigerators, were left outside the building. Not only that, but generators and bakery machines were also vandalised and dumped outside. The hotel was first attacked on July 12, 2016. 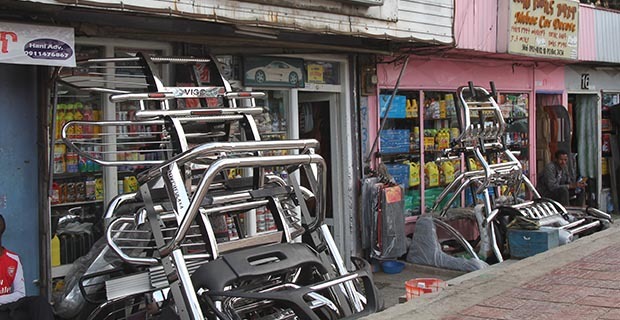 It was on third round of attacks that the looting began, he said. “Though we were looking forward to insurance coverage, there seems to be a long way to go until we see that,” said Kewanit. Such insurance coverage for damage caused by unrest, or even in general, are rare in Ethiopia’s insurance industry. Almost no insurance company gave such guarantees. “One reason is that there is no demand for such insurance policy,” said a middle level manager at a private insurance company. 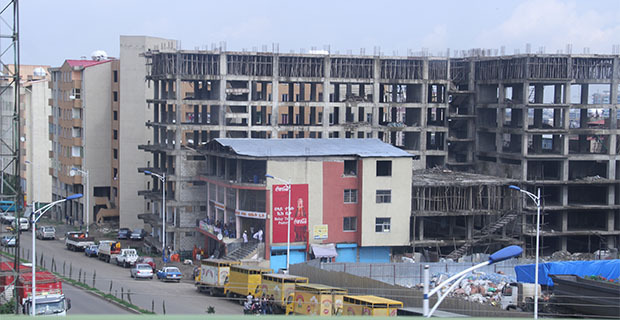 The manager shared his experience of the aftermath of the unrest in the Oromia region, where investors and businessman claimed on insurance but did not receive any payments. The nascent nature of the industry, small amount of premium paid and the potential of great damage is behind the absence of such a product, the expert explained. In the future, he sees a potential solution to this standoff in insurance coverage of political unrest. “Now, following Ethiopia’s involvement as a member of African Trade Insurance Agency, the business sector may have the chance to get insurance coverage to damage emerging from political risks,” he added. A manager of one of the affected hotels spoke of his personal frustration over the unrest. The gap between the regional and federal justice enforcement bodies is at the heart of the broken preventive and protectionist measures taken. The trouble first erupted following a joint operation by the federal police and the anti-terrorism task force against some members of the Wolqayit Committee, whose members the federal government alleges are part of an outlawed terrorist group. The operation was conducted at around 4am onward on July 12, 2016, with neither the city nor the north Gondar zonal administration informed about the operation. The operation targeted individuals who are resident in the city and known by their active engagement as members of the Welqayt Committee. This committee has been active in the city and had been holding a number of meetings. 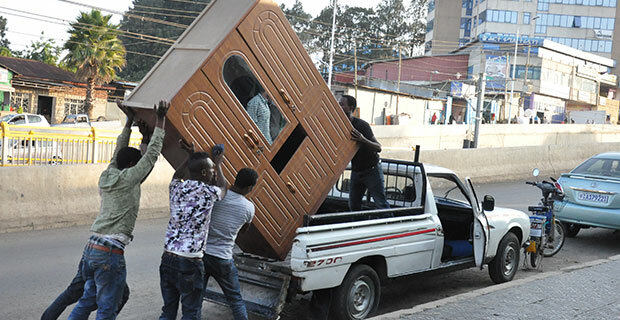 In this operation, four individuals, all said to be members of the committee, were arrested by the task force and taken to Addis Abeba. A fifth member, Demeke Zewdea (Col), then opened fire on the task force as the taskforce. tried to arrest him. 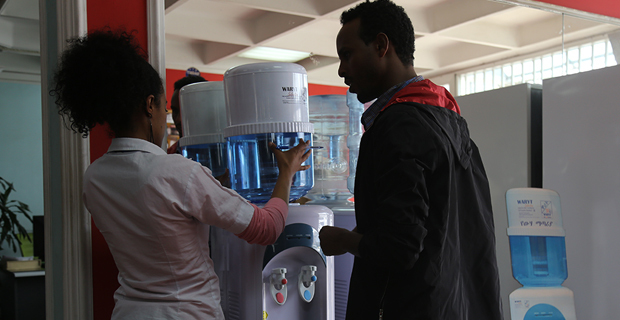 The confrontation between Demeke and the force finally sparked full-scale unrest in the city. The Anti-terrorism law enclaves the jurisdiction over terrorism crimes to the federal mandate and federal Supreme Court. “Though it is a clear mandate of the special force from the federal, consultation and concerted action would have saved us from the unforeseen and extended damage,” Mekoanent argues. The case of the Qemant Community was already something that the region had been working on; the abduction and killing of an Ethiopian along border with Sudan and boarder delimitation issues with the Tigray region over Tegedea were issues that would have been solved in a timely fashion. This is the second major conflict this year in the Amhara region. 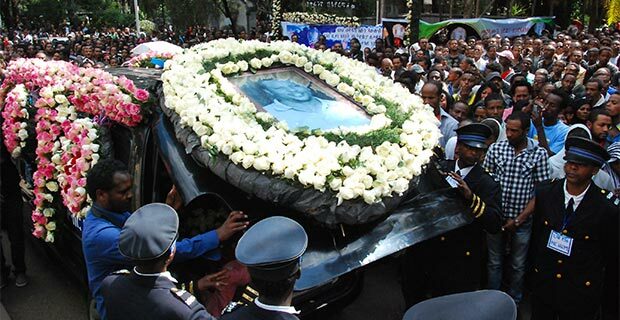 A report by Ethiopia’s Human Rights Commission last month and disclosed to Parliament found that 97 people were killed and 86 injured, some seriously, during the unrest. In addition to hotels, banks have also felt the heat. Some of them have closed their offices for five straight days. A banker who works at Abay Bank shared his experience, saying that the bank had closed its three branches for five days. On those days, on average the bank could earn at least 200,000 to 300,000Br in profit. The transport sector has also been affected by the unrest. 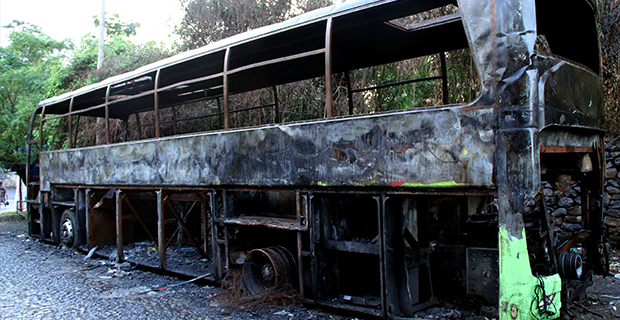 Specifically, one bus owned by Selam Bus was set on fire and completely destroyed. 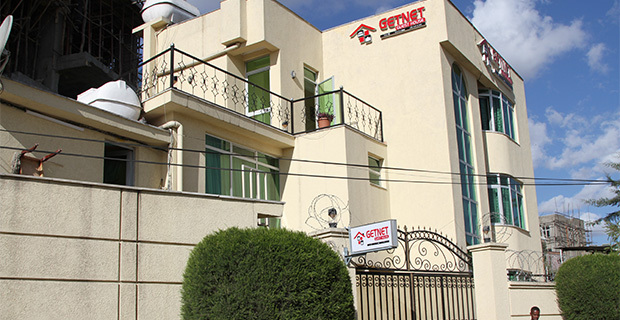 Since then, the company has closed its office in Gondar and halted its daily service to the city. The 52-seat Selam buses cost 2.5 to five million Br. 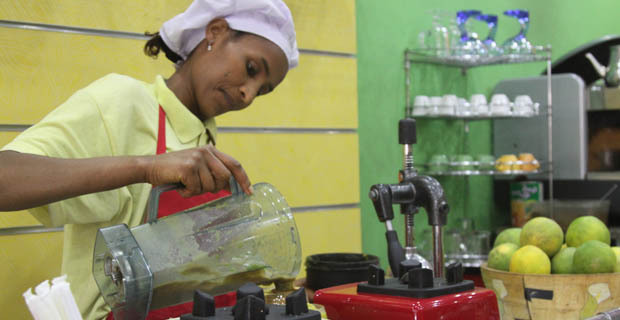 The company charges 422Br a person to travel to Gondar from the capital. The unrest in Gondar has somehow also spread to other towns in the zone. Places like Debarq, 100km north of Gondar, saw both property and vehicles damaged. The North Gondar zone is the largest zonal administration in the Amhara region, both in terms of the area coverage and population, 3.5 million – close to 20pc of the total figure. 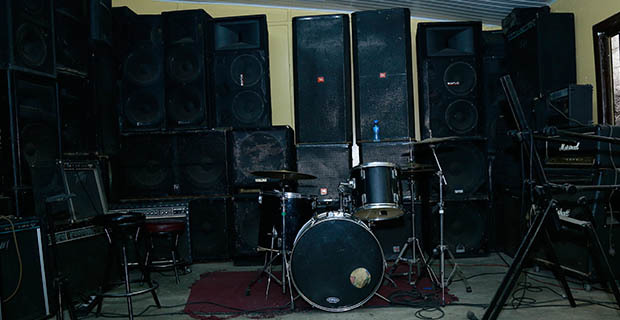 It comprises 16 woredas under it. Geographically, the zone is bordered on the north by the Tigray region; on the west by the Sudan Republic; on the east by Wag Hemra and on the southeast by South Gondar. “Throughout the unrest, our main priority was saving the lives of civilians, rather than protecting property,” according to Mekonent. Following the unrest, the high political appointee of the region and central committee of the Amhara National Democratic Movement party, which rules over the region, were said to have gathered in Bahir Dar to discuss the issue. Moreover, last week, Bereket Simon, a veteran of the ANDM, was in Gondar to discuss with the zone and city officials. “We are working on the issue,” said Mekoanent. The story published on Volume 17 No. 848, Sunday, July 31, 2016 with the headline Calm on the Surface, Bubbling Tension Underneath had some errors, particularly on the story’s blurb and body where it was noted that the clash was between the federal police and the anti-terrorism task force. The case was actually a conflict that ensued because of a joint operation by the federal police and the anti-terrorism task force against the Wolqayit Committee.